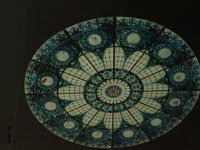 If you know of the whereabouts of any old stained glass ceilings by Paul Lucker Designs / Lucker Decorative Glass Structures Ltd that are available for sale, please let us know! We made hundreds of ceilings and domes in the stained glass boom years between 1985 and 1995, and most of them that we know of are still in use and doing a great job! But others have been displaced due to site redevelopment and change of use, and it is these that we would like to hear about. The ceiling shown is one of a pair that we made in the mid eighties for what was then the Post House Hotel at Guildford. Are they still there, and if not, where are they? We are also particularly interested in the many mixed-media art deco `Poirot` ceilings that we made during the same period. Some of these featured composite metal frames in snowflake shapes with tiered timber surrounds, as well as special glass effects. These would be hugely expensive to produce today, hence our interest in buying any back that may become available. If you have any information, or would like to sell us back one of our ceilings, please email paul@paulluckerdesigns.co.uk with some identification to authenticate the item. Please note that we do not buy and sell stained glass by others.